View Poll Results: Studio Series 02 Stinger - worth buying? * Very appreciative that this is a new mould and not a repaint of Bumblebee. * Colours and paint ops are really well done. * The overall size of this toy is the same as the previous Deluxe Stinger but the head height is about a centimetre shorter. 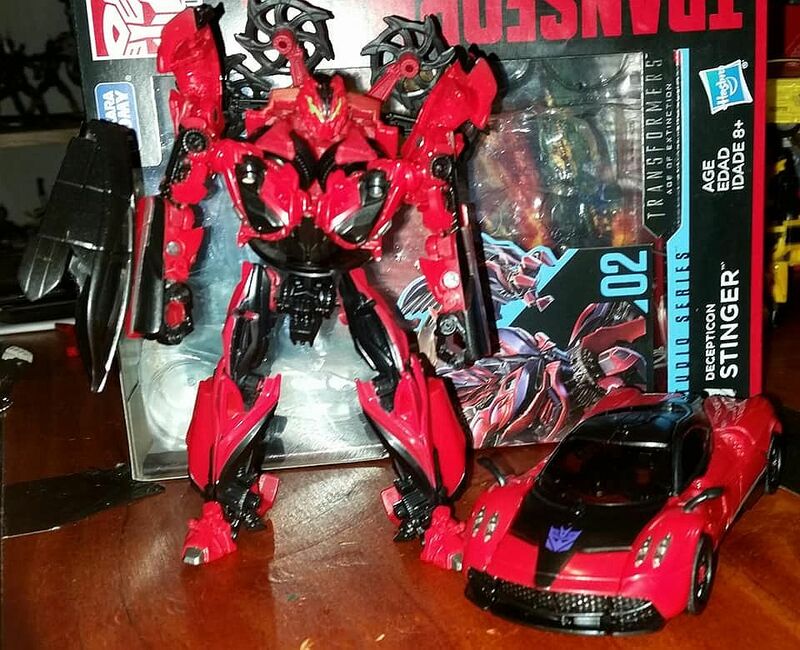 * An impressively sophisticated transformation above your typical Deluxe figure! Almost approaches Voyager level of complexity. * Having the entire roof and both windows forming a single piece attached to the right arm is kinda weird. Not sure where they were going with that. I don't think it's necessarily bad or good, just different. Certainly does add an additional layer of difficulty to the transformation. * The back-mounted rack that holds the ninja stars is stupid and annoying. It also gives the car mode bugger all clearance and can impede with the wheels sitting flat on a surface and rolling. I wish it were removable. Ideally I think that they should've ditched it in favour of other features like adding hinges on the rear wheels to let them fold inwards or giving Stinger a gun. That rack needs to rack off. * Overall: an above-average figure that's worth getting. I would vote "Yes" on the review poll which appears to be missing on this thread. Last edited by GoktimusPrime; 8th April 2018 at 09:50 AM. I'm a big fan of this one. I've flipped it back and forth between modes a few times now and to be honest I think this is the most enjoyment I've had from a Movie deluxe since the Hunt for the Decepticons line. The transformation is a bloody treat on this one, especially the torso and the legs. It's all straightforward without being obvious. I'll echo Gok on this though - would have preferred a standard gun and one more layer of calf transformation instead of the spinny thing rack. Nonetheless, I'm glad to see they can still make figures of this complexity on this scale. Vehicle mode is puny, but very very dense. Not a lot of hollow or wasted space in there. I haven't had any issues with rolling clearance through multiple transformations. A good amount of paint for a 2018 deluxe, with the only big misses being the hubcaps (standard) and the tail lights. Everything tabs into place solidly. Transformation is as above really good. It's complex but intuitive. 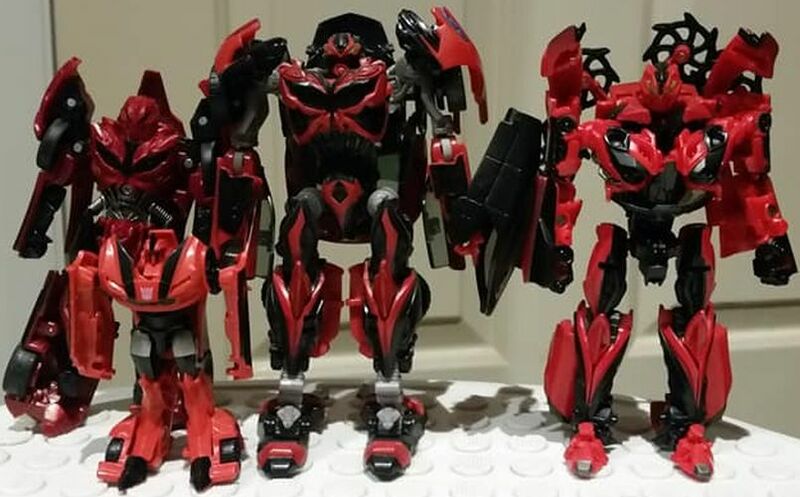 I especially love the diagonal waist rotation and the way that the outer calves rotate around to shift mass and compress for vehicle mode/decompress for robot mode. This is a toy that could have been done with a much much more boring transformation if the designers had wanted, and I'm ever so glad that they didn't go down that path. Robot mode is also great. The puny vehicle becomes a (maybe whiff below?) standard sized deluxe. Great poseability, only missing a waist, wrist swivels and side-to-side ankle tilts. The roof of the vehicle forms a cannon on the robots right arm. Your mileage will vary with that one and I've seen it criticised, but I quite like it. I'd rather this than it just forming a backpack or something. The weapons, being the spinning things, aren't great. Fortunately the armature that they sit on in robot mode is only a mushroom peg and can be easily dispensed with. To be fair, as much as I dislike the gimmick, it doesn't particularly get in the way of the robot mode posing as there are enough joints involved that they can maneuver out of the way of most poses. Last edited by SharkyMcShark; 9th April 2018 at 05:08 PM. This one was initially one I was really excited for, but the reviews made me rethink-however getting in hand made my initial excitement totally justified. Robot mode is epic-super expressive, great use of kibble (looks really alien and evil) and I like the roof/gun and the stars are a fun add on to change the look of his poses. Transformations is really cool, so much going on!! 10/10 recommend, even if he's pretty small for $35. Was on the fence about this guy - no real strong connection to the character (remember that iconic scene from AOE where he took off down the road with 'Galvatron' and then did nothing?) and the small size of some of these SS figures was off-putting. But I caved and bought on the basis of what looked like a cool transformation, and I'm really glad I did. One of the most enjoyable transformations we've seen in a long time. People are comparing these SS figures to ROTF era, but I'd say they're better than that because the ROTF was complicated and fiddly whereas these are involved but not frustrating. I remember a lot of the ROTF stuff being a massive PITA, while the 3 SS figures I've picked up so far have all tabbed together smoothly, everything goes where it's meant to. Complicated but fair. The robot mode cuts a mean silhouette and the ninja star wings don't bother me that much (but it's easy to get rid of them anyway as others have said. Likewise the arm cannon works in person better than in pictures. The car mode is just badass. Will need to touch up the paint on this guy in places but overall this is a cool figure. 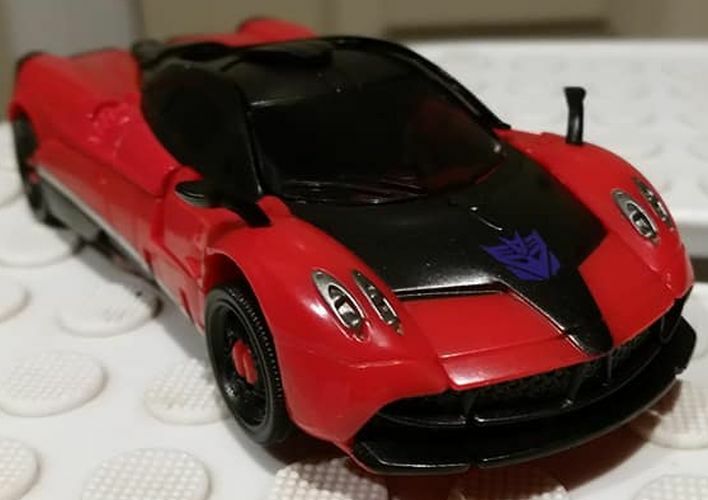 The fact that Toyworld scanned it up as 'Strawberry Shortcake' for only $25 was really just icing on the cake (I'll fix them up the difference next time I'm in, probably). I was also unsure about this one, but I picked it up on sale over the weekend. It's quite a nice figure and most of my comments seem to echo the others that've posted ahead of me. Out of the box the figure seems really small, but despite this the transformation is quite interesting. The arm cannon is a weak point, gets in the way a bit, but otherwise everything twists and spins in interesting and fun ways. 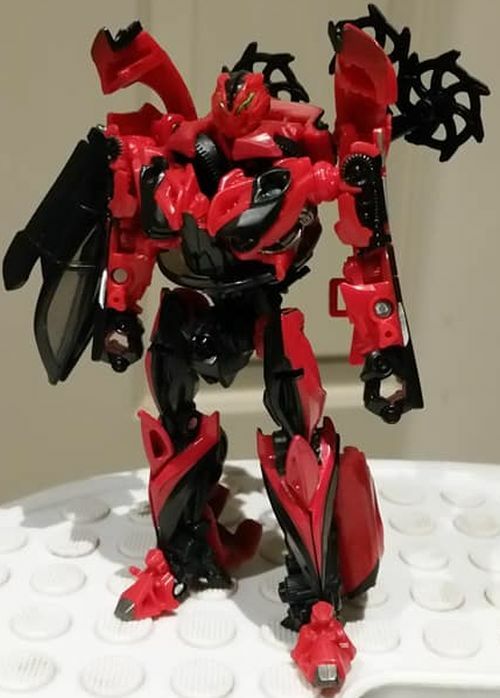 He does remind of similar red deluxes (FE Cliffjumper and Knock Out) both of which I highly rate. 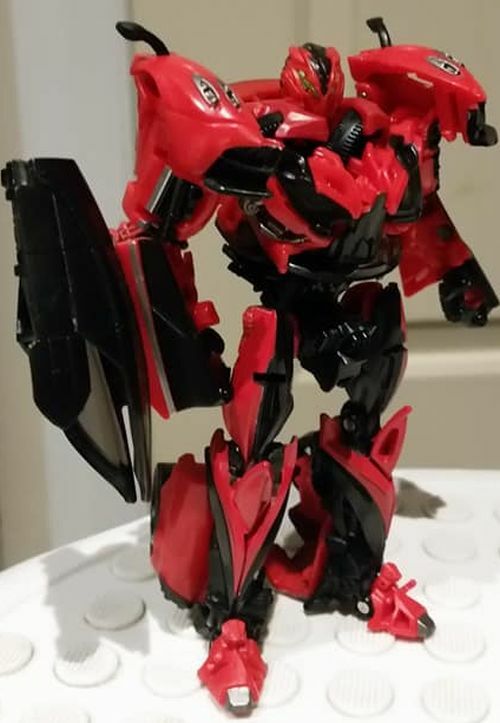 He's good enough that I'm now going to buy Studio Series Jazz which I'd previously ruled out.